gMSA (Group Managed Service Accounts) come along with the introduction of Server 2012, these aim to increase the security of service accounts by removing static & known passwords. However, they do introduce their own complications. If your running a Microsoft infrastructure of any size, there is little doubt that you will have a number of service accounts within Active Directory used by software and automated tasks throughout your environment. There is now another route to securing these accounts, in comes Group Managed Service Accounts (gMSA). There are some great resources online to do with configuring these (some below), but this guide aims to cover the basics to get you running, which I needed while deploying AD FS on Server 2012 R2. 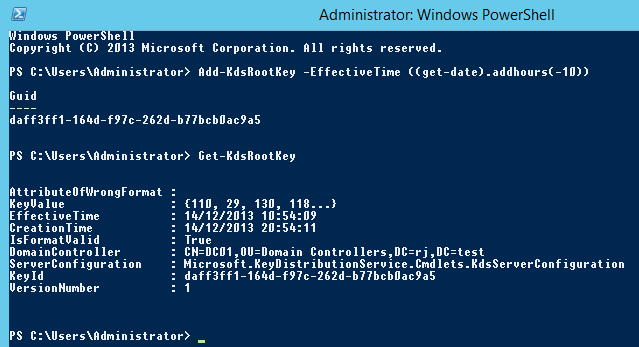 Before you can use gMSA in Server 2012 R2, you need to perform the one time operation of generating the KDS root key. I found a number of blogs/howtos online while, but couldn’t get this running in my environment to start with for two reasons. 1. You will require a Server 2012 R2 domain controller within the forest root domain (We only had one in the child domain initially). Create a security group and add the computer accounts for the servers that will use this account to the group. 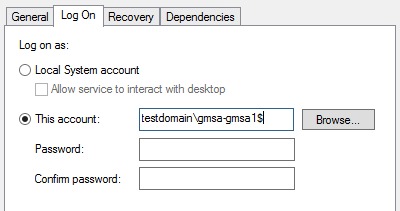 New-ADServiceAccount -name gmsa1 -DNSHostName gmsa1.jervis.local -PrincipalsAllowedToRetrieveManagedPassword "gmsa-gmsa1grp"
Any other task or service (on the gMSA target server) could use that gMSA account to run. You need to consider the overall security of the servers and environment. In most cases, if your able to use a gMSA account, its likely to increase security mainly due to the automatic management of passwords. More secure: As the admin that has left can’t login to your servers with his account as its disabled and he does not have any service account passwords. A nasty hole could be a batch file that is in a publicly writeable share, which runs regularly as a gMSA account that has domain admin privileges. This is true of any account and not just gMSA, but consider how easy it would be to just enter that username against any service or task thats being created. As always you need to provision following the principal of least privilege, and educate admins in how these accounts can be used to increase security while reminding them how issues could occur. Sometimes it maybe best to use a gMSA account, sometimes a standard user account (with tight password management). I think the Add-KdsRootKey commands are reversed. In production, the KDS key needs 10 or more hours to propagate to all AD servers in the farm. Add-KdsRootKey –EffectiveTime ((get-date).addhours(-10)) will override 10 hour delay, run “repadmin /syncall /AedP” from one of DC to start AD replication, wait until replication finishes and you are good to go.